The Toyota lineup is jam-packed with different hybrid vehicles, perhaps the most of any brand’s lineup available on the market. Whatever your regular vehicular needs are, there’s a really good chance that Toyota not only has a vehicle that meets them, but also a hybrid vehicle that meets them just as well. For instance, want a vehicle with plenty of room for your family but not exactly interested in a minivan or crossover? Consider the 2018 Toyota Prius v in Edmonton AB. Technically a revival of the classic station wagon class, the Prius v offers plenty of space for you and your small family plus all of the cargo that comes along with it. As we mentioned, it also offers an option that’s different from the plethora of other family vehicles out there. Plus, it’s a hybrid – and not just any hybrid, a member of the iconic Prius family. Although the Prius v isn’t quite as large as a minivan or SUV, it was built with spaciousness in mind. You and your family will fit comfortably within the confines, and the extended cargo area offers plenty of space for luggage or whatever it is you need to bring along. But, of course, its real claim to fame is its hybrid powertrain. Equipped with a Hybrid Synergy Drive powertrain, which combines an electric motor with a 1.8L 4-cylinder engine, the Prius v manages to achieve an impressive 5.5 l/100km through city streets and 6.0L on the highway when equipped with its automatic transmission, while still generating 136 horsepower. That’s not a ton of power, but it’s plenty to get you and your family on the move. 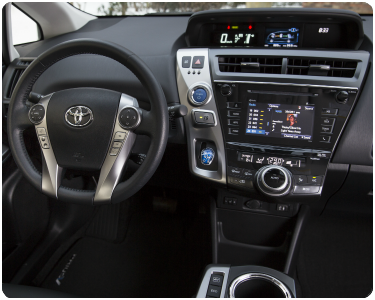 There are a number of other features and impressive specification found in the 2018 Toyota Prius v, so if you’d like to find out more don’t hesitate to give us a call. We’d love to get you in the driver’s seat of one for yourself!